When was the last time I'd baked a quiche? .... Couldn't recall when was the last time ... but I think I've baked it once last year. 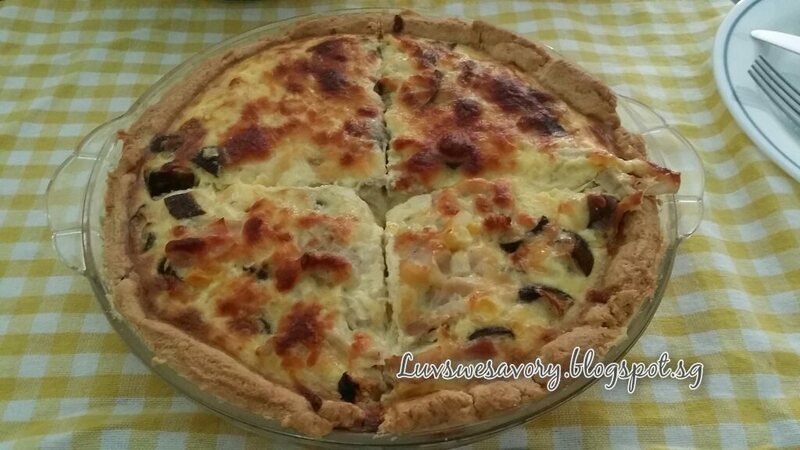 I've made many times of mini quiches in Year 2014, replicated from the recipe here with different choice of fillings. Decided to bake a big savoury quiche (25cm pie dish) for our weekend lunch. Realised that my "pie skills" had turned rusty :( .... should have rolled the pastry dough thinner. Prepare the short crust pastry first. Cut cold butter in small cubes or pieces, pour into flour. (Depending on the weather, if warm, freeze the cut butter for about 4 - 5 minutes). Blend into the flour mixture with a pastry blender or fingertips (not palm) using rub-in method till crumbly consistency like coarse crumbs. Add in water to the flour mixture and mix to desired consistency until it forms a soft ball. Flatten the dough slightly into a round disc, cover with plastic wrap. Refrigerate for about 30 minutes or just until firm. Lightly grease the pie dish with some butter and set aside. Position the rack in the center and preheat oven to 180°C. (The temperature of the oven may vary, do adjust accordingly). On the lightly flour surface, roll out dough to about 3mm thick and fit into the prepared pie dish. Gently press dough to cover all the sides. Rest about 5 mins before tidying the edge with a knife or scrapper. Lightly prick bottom of pastry crust with the tines of a small fork. Line the pastry with baking paper and fill with some dried beans or rice. Bake for 10 minutes. Remove the paper, beans or rice and bake for a further 10 minutes or until light golden. In a jug or bowl, beat egg, liquid and strain. Set aside. In a big bowl, mix and combine all the ingredients (except the liquid). Fill the pie base with ingredients (slightly 3/4 full). Pour liquid into pie dish to 3/4 full. Top with some Mozzarella cheese and bake about 35 - 40 mins. 1) The temperature of the oven may vary, do adjust accordingly, suggested 180°C - 200°C. 2) If prefer to make individual small quiches, divide the dough accordingly. Eg 25g for muffin size foil case. 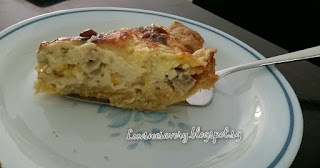 Quiches are one of my family favourite! This looks delicious and perfect for lunch and tea-time makan! Thanks for the compliment, Joyce. 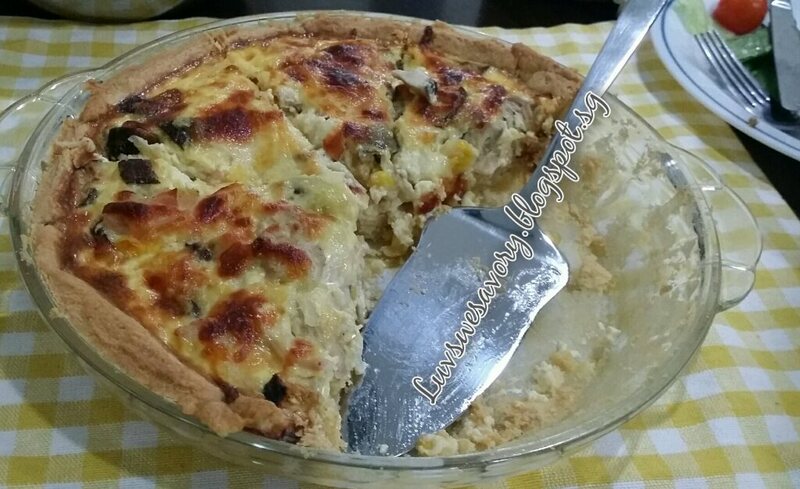 Hi Karen, your quiche looks delicious, I can see why your kids loved this. Take care! Thanks Cheri. Yes, they missed this a lot. Hi Phong Hong, yes you should and I can imagine you may load it with char siew or roasted pork ... can't wait to see your signature dish! 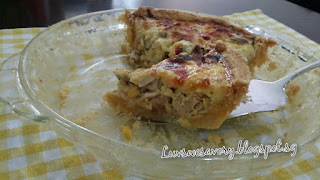 We love quiche and always enjoy eating them for dinner. I can see yours got a lot of hao liao :) Yum yum!